Want a super yummy treat to make for your Christmas Eve or Christmas day get-together? 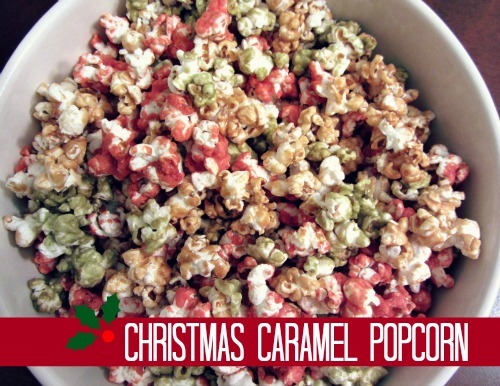 This caramel popcorn is UH-mazing!! I promise! I made a huuuge bowl of it for our church Christmas party and came home with an empty bowl! I found the recipe on Baked Perfection. So what you need to do first is pop a whole bunch of popcorn. 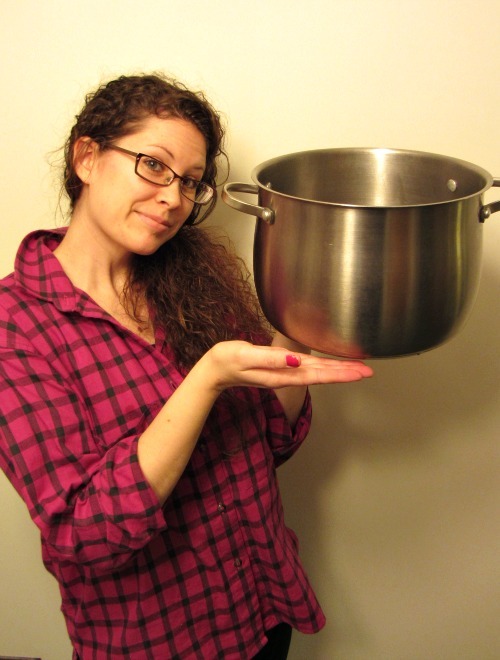 Instead of popping the microwave bagged popcorn like Risa did, I just did it on the stovetop in a ginormous pot! If you have popcorn kernels, the directions will be on the bag. But you will pour a little bit of oil in the pot, maybe about 1/4 of a cup. 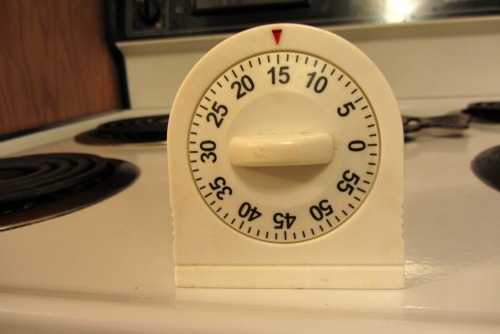 Turn the stove on to about medium low. 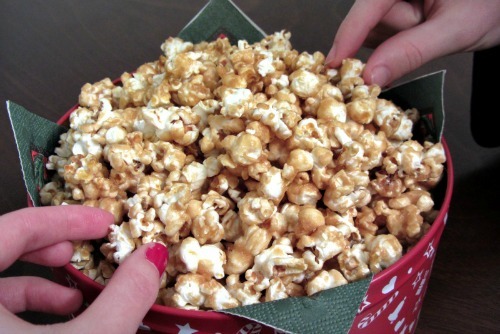 Then you put ONE kernel inside, close the lid and wait to hear it pop. Then you'll know the oil is hot enough to pour in the rest of your kernels. You'll only want one layer of kernels in the pot, so pour them in till the whole bottom pan is filled of one layer- no kernels on top of each other. Then you just shake the pop around a little here and there. It makes lots of noise banging around. :) But I LOVE hearing the sound of the popcorn popping! After it's all popped, I split it between 3 of my sprayed glass baking dishes. Start by heating your butter, brown sugar, and corn syrup in a medium sized pot. Stir, making sure to get all the clumps out. Bring it to a boil and keep stirring. Then let it boil for about 5 minutes. I let it sit without stirring too much. After 5 minutes, remove it from the heat and immediately add the baking soda and vanilla. The baking soda kind of changes the color and makes the caramel look a little puffier.. maybe that was just my eyes..
Now we want to split the caramel 3 ways. So first I pour 1/3 of the caramel over one dish of popcorn (just eyeball/guesstimate what 1/3 is). Then I pour another 1/3 of the caramel into another pot and added green food coloring, then pour it over a dish of popcorn, then I added red to the remaining caramel left in the other pot. I actually had my Hubby's help because I was stressing about the caramel setting too quickly before I could get all of it done! So I actually reheated the last bit of caramel again to get it pour-able again. As hubby was reheating and stirring, and I was stirring and coating the other dishes of popcorn. When the caramel cooled a bit, I put down my spatula and just used my hands to incorporate the caramel all over the popcorn. 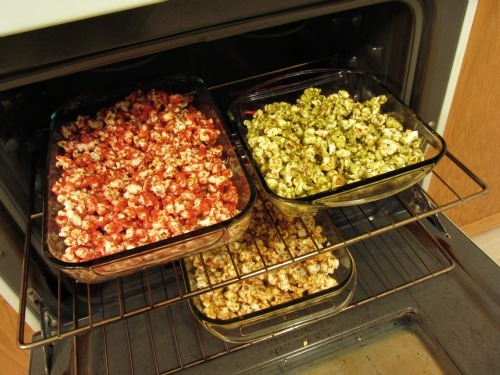 When all the popcorn is coated with caramel it gets baked in a 250* preheated oven. When the timer is done, stir the popcorn around. Set the timer for another 15 minutes. Then stir the popcorn again. Then set the timer for the last 15 minutes. Taste your homemade caramel popcorn and freak out because it's so great and you'll never buy caramel popcorn at the the store ever again! ... Atleast, that's what I did! I made another batch just for Hubby and me later that week since we didn't get much of it at the church party! .. I just didn't add the food coloring step.